Abstract: We present a theoretical, numerical, and experimental investigation of the polarization dependence of cross-phase modulation in nonlinear birefringent fibers. Two new methods are described for producing a polarization-independent spectral shift through cross-phase modulation of a weak probe signal by a copropagating strong optical pulse. 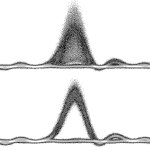 The birefringence of the fiber and spectral separation between the pump and probe signals are shown to play a critical role in determining the polarization dependence of the cross-phase modulation process. The methods are experimentally verified in two different highly nonlinear fibers, and are used to achieve polarization-independent optical switching at speeds of up to 160 Gb/s.